Andrea from Urban Quiltworks had a post on her blog this week about donating quilts to those that lost everything in the Alberta floods. I thought this was a wonderful idea and asked her where would the best place to send a quilt. 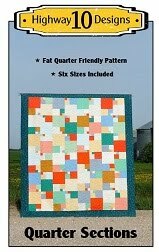 She said that The Sewing Room in Calgary is collecting quilts so that is where I’ll be sending my Serenade quilt. I quilted it yesterday and got the binding on today so it is ready to go. I’m going to keep it until our next guild meeting and see if the guild and other members have any quilts they would like to send too. This is Valerie’s Island Sunrise wall hanging and she did her quilt in black, gray and white. Love the touch of red in the inner border, really makes the whole quilt shine. She said I could custom quilt it how ever I liked and since it had a nice wide black border I had to do some curly feathers. This is Diana’s Bargello bed runner and the pattern is called Southwest Movement. 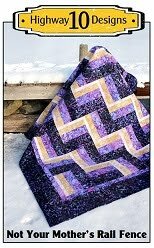 I love the colors in this quilt and the fact they are batik fabrics doesn’t hurt! I quilted free hand swirls using a brown variegated Lava thread across the whole quilt to add texture without taking away from the piecing. It’s been cloudy and rainy here all week with no end in sight. So I found a dry moment to get some pictures but they don’t show the quilting that well but the colors are very true. Here it is, my Curve It Up quilt top and I finished it before Jenny starts her next Quilt Along! :) You may have noticed my quilt top does not have the curved sashing design that Jenny created and that I did the ‘no seams’ tutorial on. 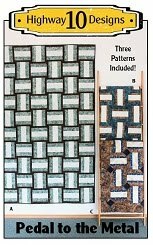 I struggled with finding the right fabrics for that design and it just wasn’t working for my quilt top. So onto plan B, sash the quilt with background fabric, since I dyed 3m of it, and have the blocks float. I surprised myself when I was shopping for a batik fabric for the outer border. I picked a few bolts off the shelf and almost put this one back as I thought it wouldn’t look good with the blocks, boy was I wrong, it was perfect! So always auditions fabrics even when you think they won’t work because sometimes they are exactly the fabric you need. I’m really happy with how it looks and it was fun making a quilt with my hand dyed fabrics. 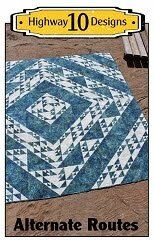 I hope to get this one quilted this summer while I’m taking a break from quilting for others. Only two more to go and then I’m free for the summer! 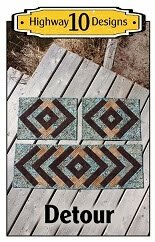 This is Phyl’s Cobblestone quilt done in bright jewel tone batiks. She made this quilt for her daughter Laura who just bought her first home. That is such an exciting time and this quilt will be a wonderful house warming gift from her mom. I used a bright jewel toned Lava thread and Tickle for the panto design. The backing is a beautiful pink batik and I used matching pink Bottom Line thread in the bobbin. 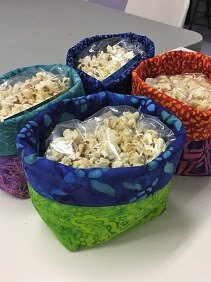 Last week Lori posted a tutorial on how to dye fabric using ice cubes, it is similar to snow dyeing. She did a ‘parfait’ which is layering a few fabrics in one jar and using different dyes on each layer. You can see Lori’s instructions here. I had never tried dyeing a parfait or using ice cubes before so I wanted to give it a try. The top pictures shows my jar with three layers of fabric. The bottom layer has Bright Yellow and Cerulean Blue, the second layer has Hot Pink and Bright Yellow and the top layer is Cerulean Blue and Hot Pink. I used more dye powder then Lori suggested as I wanted dark bright colors, I used about 1 tsp total per layer. You can see the dye powder on the ice cubes in the next picture. I also crushed my ice cubes a bit, Tim smashed them with a hammer for me. I had tried using the blender but it just made slush. I let the ice and fabric sit in the jar overnight. By morning all the ice had melted and the jar looked like this. You can see my excess dye powder on the fabric that didn’t dissolve. I think I would use a bit less dye next time. Here are the results of my half meter pieces. There is a similar texture to snow dyeing and I like how the colors from the other layers sneak into each other fabrics without over powering the main color combinations. This is Gail’s Curved Log Cabin quilt and she asked me to quilt feathers, any kind of feathers. I decided to do open feathers and have the ones on the beige fabric going clockwise and the ones in red fabric going counter clockwise. I matched the thread color so had a lot of thread changes as I would complete a section and then roll. The sun finally decided to shine as we’ve had lot of rain this week but we really needed so I’m not complaining as it as been so dry here. Not much quilting going on here this week as I spent 3 days working kitchen duty at my son’s Grade 8 camping trip. This was my fourth and final time volunteering at this camp as the school only organizes this activity for the grade 6 and 8 students and I went with both boys for both grades. There were three of us working in the kitchen and we got along great so that made it a lot of fun. Only had to deal with one minor incident and that was due to the previous group at the camp leaving a puddle of bacon grease in the oven. When we turned on the oven for the first time we were wondering why smoke was pouring out of it! We opened up the oven door to find a flaming grease puddle!! We shut the door and the fire eventually suffocated but the kitchen and dining hall was full of smoke! Took a few hours for that to clear and we joked that since we all smelt like smoked bacon the bears will be looking for us licking their lips! Thanks goodness there were no bear sightings this trip. It rained on and off but that didn’t stop any of the kids activities. 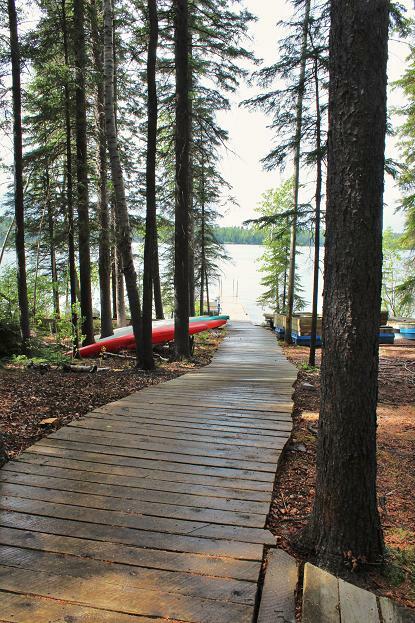 They canoed, fished, hiked and baked bannock over the campfire whether it was raining or not. I took these pictures early on morning before the kids were up. Here is the kitchen/dining hall and the next pictures is of some of the cabins, there are 10 in total. We came home Wednesday and then today I took the boys to the orthodontist which is a 800km return trip so tonight I’m exhausted!! Don’t think I’ll be doing any quilting until next week as I’m so behind with the housework and still have to finalize a few more details on our kitchen renovation.